As a property manager, the duty will likely fall on you to find a commercial cleaning company that provides all of the professional cleaning services your facility needs to operate smoothly. The process of calling and interviewing different janitorial companies in Missouri can be a challenge, but proper research and effective planning will prove to be very beneficial in making the challenge easier. Crystal Clear Enterprise is proud to be your source for the best janitorial services in Kansas City, delivering reliable results that aim to optimize cleanliness and efficiency of your facility. Since 1997, our experts have worked hard to develop a system that promotes the best office cleaning services by focusing on high-quality personnel and training programs. Receiving an accurate quote for your facility can prove to be a big challenge. Oftentimes, cleaning companies will offer a price without having the proper information or time needed to make an accurate assessment. Today, we’ll look at a few factors that should come into consideration for your cleaning quote. When you’re ready, be sure to contact our office cleaning professionals to receive our fast, accurate pricing! You will be asked about the total size of your facility and the amount of cleanable square feet. The phrase “cleanable” here is important, as many buildings hold space that is simply not utilized. From unused common areas to empty desks or cubicles, your commercial cleaning quote will depend heavily on how many square feet are involved that need regular maintenance. Throwing out the total number of square feet will result in a price that is exaggerated and inaccurate. The types of flooring included with your size estimate will also be helpful in determining an accurate price. Certain materials will require more care and therefore more payments to account for time and materials used. Carpet cleaning will vary widely from laminate flooring, and being able to provide an accurate summary of your facility will help to hone in on the actual price. 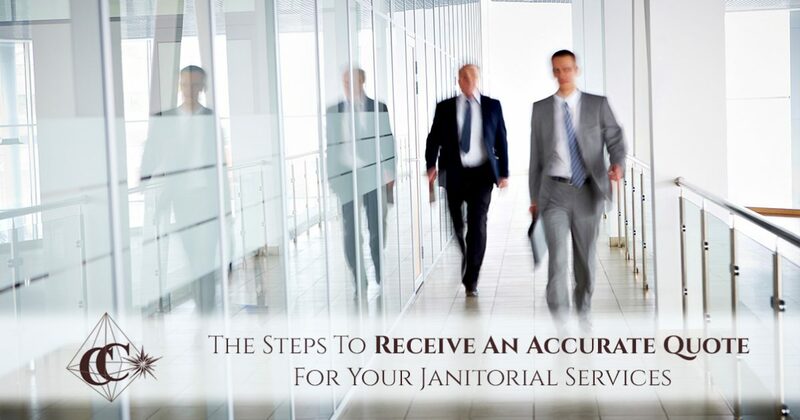 The number of guests and employees at your site will greatly determine the final cost of janitorial services. For one, more people per area will typically result in more soiled areas. While a team of 10 individuals may be messy, putting 100 people in the same space will have a major effect on the overall cleanliness of the space. Facility consumables are also a large part of any budget, including toilet paper, hand soap, and more. It’s important to procure an accurate count, as guessing incorrectly can lead to excessive expenses or a bill that is astronomically higher! It can help to find your guest manifests and employee logs to compile a strong average for the daily traffic occupying your facility. Before signing on with a commercial cleaning company, it’s important to schedule a site visit for a closer inspection of all of your facility’s unique needs. The cleaning contractors you call for bid walks will arrive to offer a precise quote on how much their cleaning services will cost. This also provides you as the customer with key insights into how the cleaning company operates and how they will provide you with comprehensive logistical solutions. While our cleaning services request for proposal (RFP) is both comprehensive and accurate, we understand that you will want to explore other options available throughout the Kansas City area. It’s important to remember, though, that the quote you receive may not be an honest representation of the services required. Some companies have been known to offer marketing ploys to get in the door, only to hike up the prices once the contract is signed. Be sure to interview your prospective janitors and pay close attention to their credentials. As always, references can be helpful for illuminating a company’s intentions and services. If you can find a reliable cleaning company with sterling reviews, the chances are high that you will receive an accurate quote. The process of hiring a new company to clean your facility may be intense, and will require numerous interviews and hours of consideration. It pays to receive a detailed, accurate RFP to help you properly budget for your building’s cleaning needs. Crystal Clear is here to help you see clearly, delivering unbeatable janitorial services to Kansas City and beyond. Our team of experts will always work to maintain the most ethical, honest system for delivering our office cleaning expertise. Contact us today to learn more or to receive a quote for your facility!